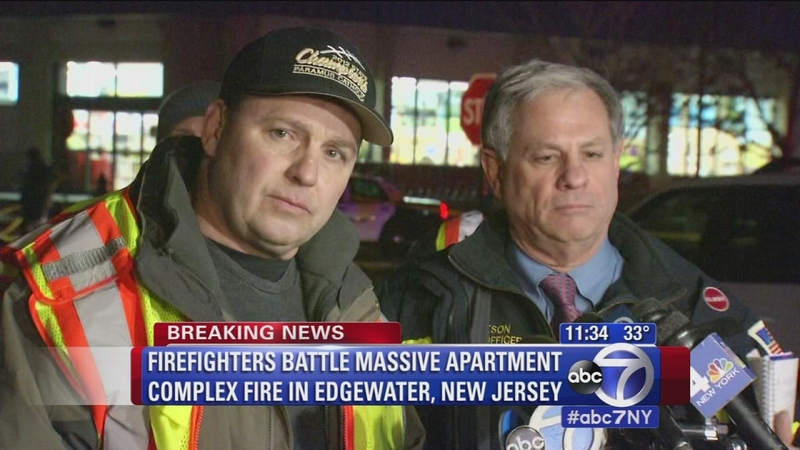 Josh Einiger and Carolina Leid report from the scene in Edgewater, New Jersey. EDGEWATER, NJ -- A five-alarm fire raged out-of-control in Edgewater, New Jersey. The fire broke out inside the Avalon apartment complex on Russell Avenue around 5 p.m. Wednesday. 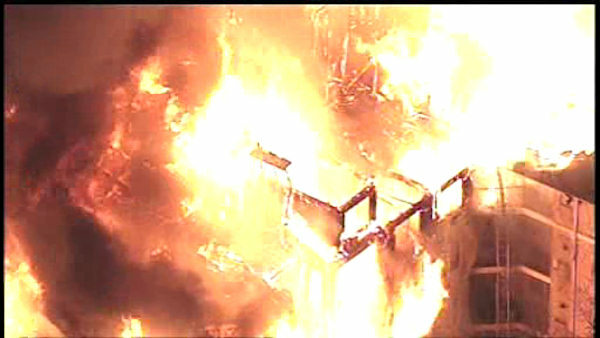 A huge fire destroyed several apartments in a complex in Edgewater, New Jersey on Wednesday evening. More than 400 people have been evacuated from the four-story building. There was heavy fire throughout the building. "This is lightweight wood construction and it's very difficult to fight because of the collapse hazard. It collapses very quickly and easily. It doesn't give the firemen a lot of time to fight a fire in a building like this," a firefighter at the scene said. "It just keeps spreading, and spreading, and spreading," one resident said. "It sounds like a freight train," another said. Making matters worse were blue flames. The fire spread so quickly that workers did not have a chance to turn off the gas in the building. Josh Einiger reports from the scene in Edgewater. Residents were led to nearby school, Eleanor Van Gelder School, located at 251 Undercliff Avenue. Displaced residents are also being directed to shelter at a nearby Boys and Girls Club. At least a dozen nearby municipalities assisting in battling the fire including Hackensack, Fort Lee, Little Ferry, Teaneck, Tenafly, Hillsdale, Englewood, Mahwah, Oakland, New Milford and Franklin Lakes. FDNY Marine units are also fighting the fire. Power has been restored to most residents in Edgewater after an earlier outage. Edgewater Public Schools are closed Thursday. Leonia Middle School and Leonia High School will be open on Thursday, although busing will not be available. Bergen County Office of Emergency Management is on the scene. The cause of the fire has not yet been determined. There are no reports of civilian injuries, although one person was rescued and carried out of the building by firefighters. Some firefighters suffered minor injuries. The building has one-, two-, and three-bedroom apartments. This is the second time that there has been a fire in the complex. It caught fire in Aug. 30, 2000 when it was under construction.